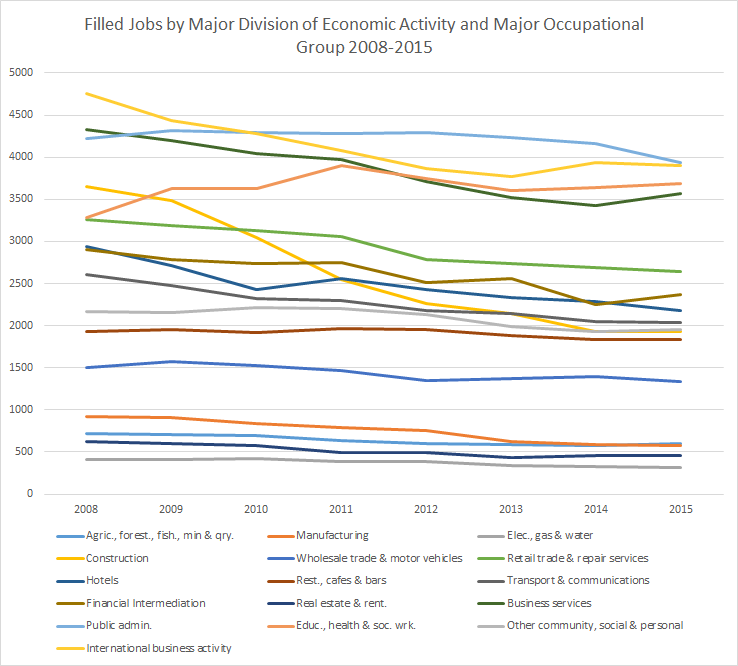 So continuing our series of using excel voodoo (aka VLOOKUP) to take a look at where jobs the jobs went, let’s take a look at what jobs losses looked like across industries. Clearly this stands out as the industry that faced the most pain of the recession. 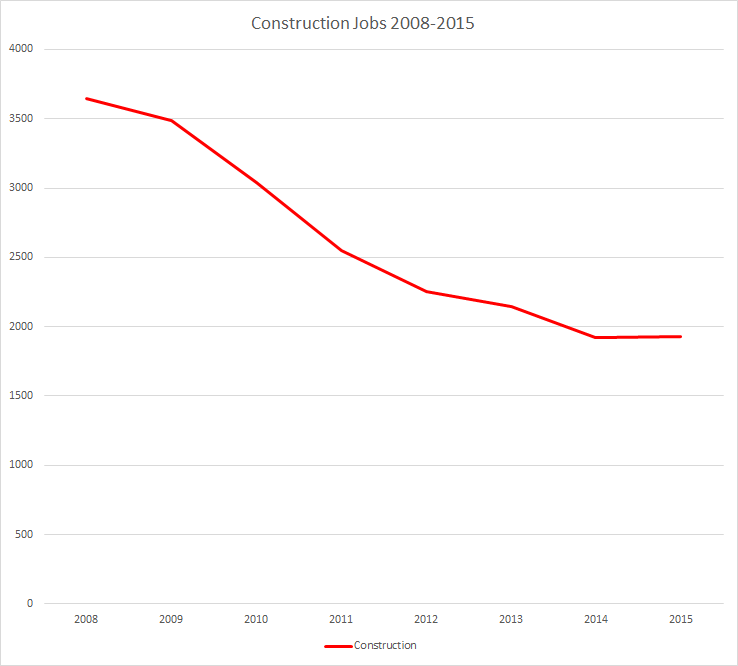 We overheated the economy and ultimately construction demand dried up causing the very painful loss of nearly 2000 jobs. 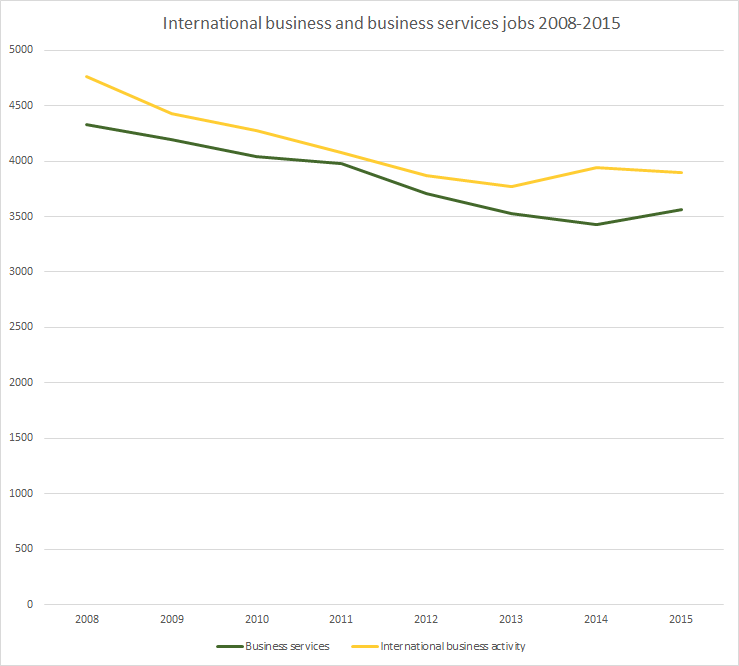 International business and associated business services have also had a painful slide with slight indications of recovery in 2014-2015. 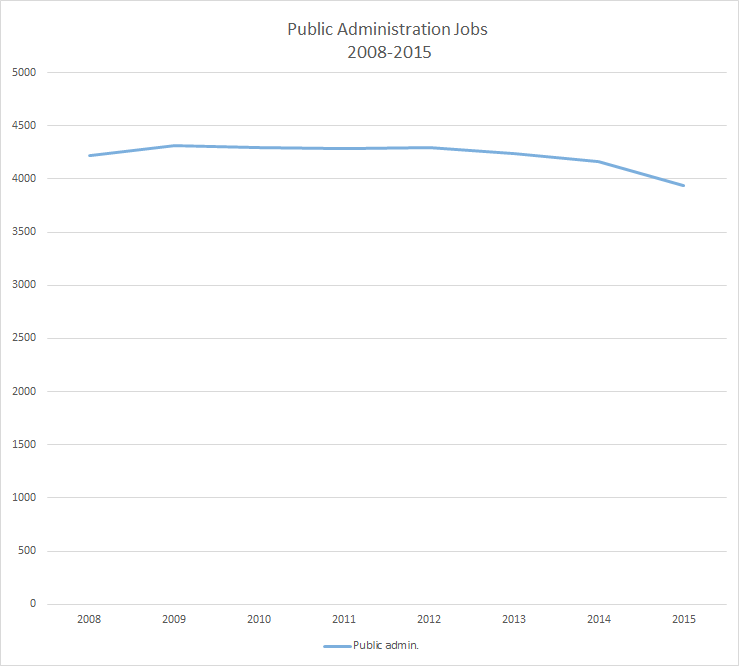 It is too bad we don’t have a picture of pre-2008 due to the change in the occupational categories as it might give us more insight into what things looked like before and afterwards. 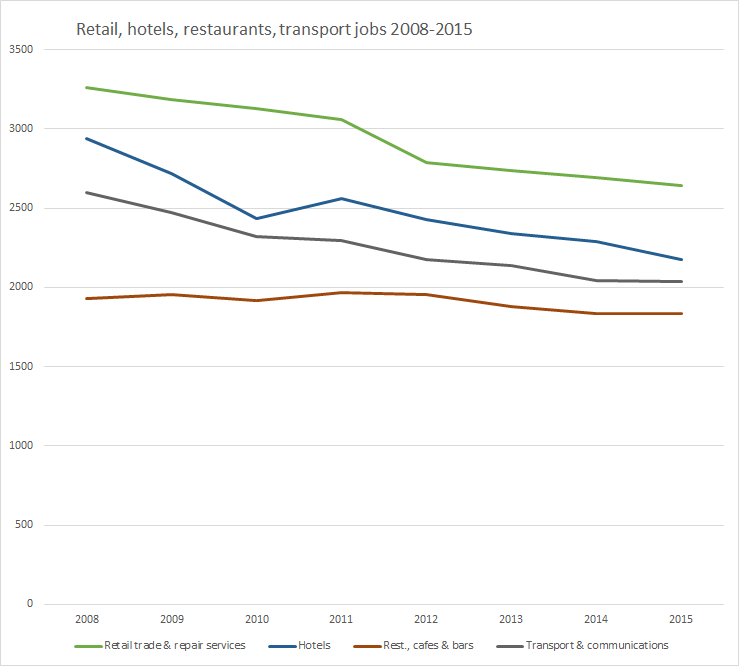 Then we can see retail, hotels and transport were all hard hit, likely especially due to the recession. Restaurants seemed to hold steady. Let’s move on to the growth sectors of the last few years. 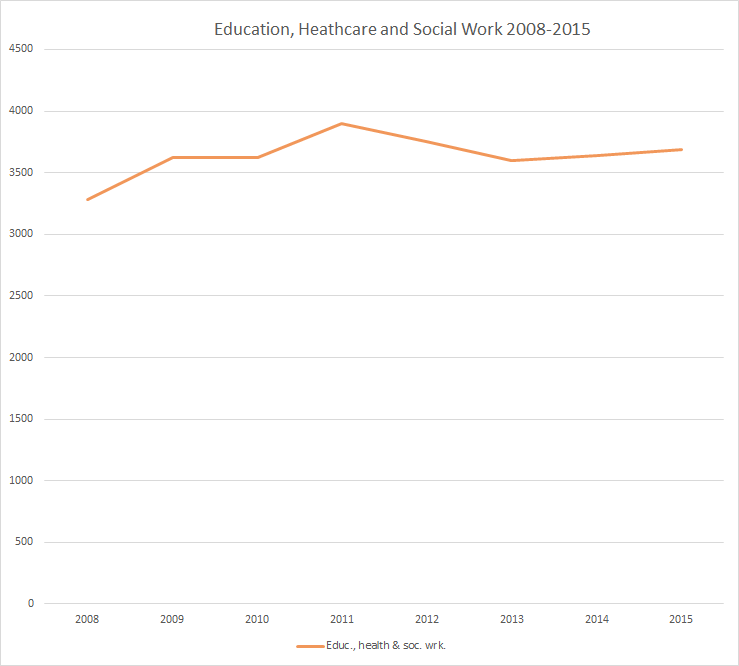 Education, Healthcare and Social work was one of the few places that saw job growth. Perhaps unsurprisingly as Bermuda was increasingly encumbered with unemployed people needing assistance. When we last examined the hard numbers for Black Executives in the Bermudian workforce, we noted how statistics of Black Executives were wildly skewed by the largely white non-Bermudian workforce. This led us to examine in greater depth Bermudians only in the analysis of levels of employment data so that we could get a more representative picture. This subsequently left us with the questions of how well represented blacks are in various levels of the Bermudian workforce when compared to Bermudian demographics. So we left off by looking at the levels of employment by Race and Bermudian Status from the Commission for Unity and Racial Equality’s Annual Review of the Workforce Survey (ARWS) Report of 2006. This gives us a good picture of present representation of blacks and whites in the workforce at various levels of employment. In order to better compare this to present Bermudian demographics, lets again review data from the ARWS Report which suggests that, in 2006, 72% of the Bermudian workforce was black, 21% was white and 7% was Mixed/Other. Initially, just by looking at these numbers we can note how blacks are over-represented in the non-professional category and underrepresented in all others. Yet this doesn’t give a clear picture without a better understanding of the actual hard numbers in each category so lets look at the actual numbers of Bermudians for each level of the workforce. Here’s the dame data as above, simply represented in another way so we get a clear idea of the representation in percentages. Percentages, however, don’t tell the whole picture. 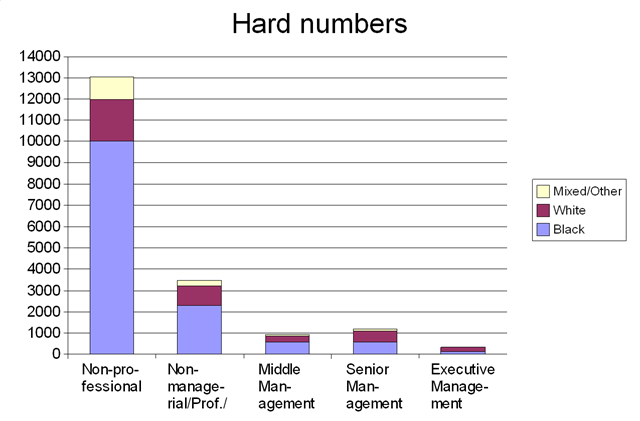 The whole picture is much better represented when you start comparing the hard numbers to get an idea of how many non-professionals there are vs. the other levels of employment. Suddenly it becomes much more clear how a 5% difference from the Bermudian demographic of 72% of blacks in the workforce can add up to such wide ranging disparities in the other categories. Indeed, in order for the various levels of employment to match Bermudian workforce demographics, 680 of the 13033 non-professionals would need to be white instead of black, 209 of the 3479 non-managerial would need to be black instead of white, as with 103 of the 940 middle managers, 285 of the 1186 senior managers and 109 of the 350 executives who would each also need to be black instead of white. However, let’s not be racist by pretending that the mixed/other category doesn’t matter and recognize that there is a 2% under-representation in the executive category equating to some 7 whites that should be mixed/other. So now that we’ve identified the hard numbers with regards to the racial disparities between Bermudians in the various levels of the workforce we’re now prepared to pursue our next question: what is the cause of these disparities? Before we got sidetracked with some weak humour, we were exploring the hard numbers for black executives. When we last left off, we were asking the question of how non-Bermudians impact the statistics that measure the level of employment on a racial level. 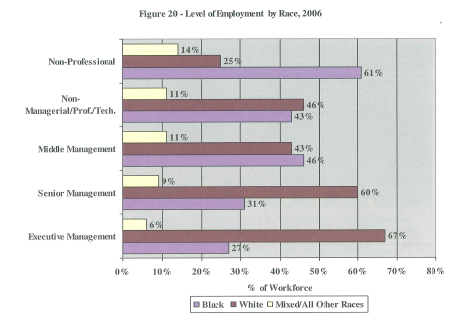 Here’s what we examined, the stat for Level of Employment by Race in 2006 from the Commission for Unity and Racial Equality’s Annual Review of the Workforce Survey Report of 2006. As suggested, it’s a startling stat, up until you realize that this isn’t a Bermudian only statistic because non-Bermudian racial demographics are included. Thankfully, CURE has also been tracking and publishing statistics of Levels of Employment by Race since 2004 so a more telling picture is available. So, what is the real picture of Level of Employment by Race amongst Bermudians alone? Ah, does this give a better picture? 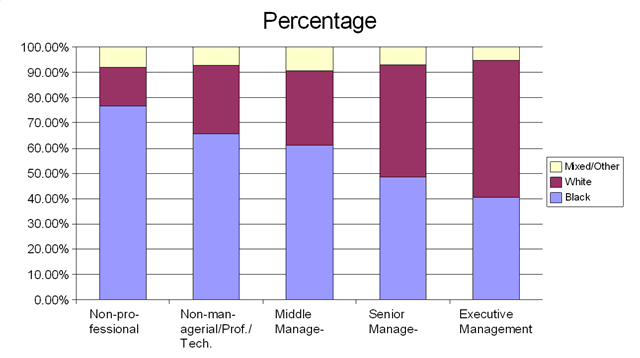 Suddenly whites no longer dominate Senior and Executive management and the numbers make a bit more sense as the disparities between the race are less drastic and closer to Bermudian demographics. While there is much more to be explored in this chart such as it’s implications of racial equality amongst Bermudians in the workforce and the causes thereof, let’s not get sidetracked just yet. So, now lets look at the demographics of non-Bermudians in the workforce by Level of Employment. Woah! Whites dominate every level of non-Bermudian employment. But wait, is that really shocking? Let’s take a rough guess at the countries that are most likely to contribute non-Bermudian workers to Bermuda. Are they most likely to be Canada, the United States and the United Kingdom? Lets run with this assumption and subsequently examine their racial demographics. According to the 2001 Canadian Census, 83% of the total population of Canada claimed they are white and only 2% claiming black. According to the 2006 American Community Survey, 73% of American’s are white and 12.4% are Black. According to the 2001 UK Census, 92.2% of UK citizens are white and only 2% are black. So, if the most likely places that our International Businesses are to pull workers from are countries with white majorities is it really surprising that non-Bermudian level’s of employment are white dominated? This when non-Bermudian demographics actually already appear to be representative of the racial demographics of the countries from which non-Bermudians originate? How representative are levels of employment by race of Bermudian demographics when only looking at Bermudians? 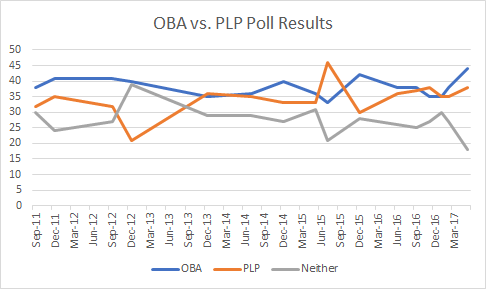 What are the likely causes for present disparities between the Bermudian races and what potential solutions are there? Does the draft workforce equity legislation adequately address the two core goals stated above? While I’m encouraged by the article in the paper regarding hotel occupancy rates, I’m still waiting on the numbers to be posted on the gov.bm website so I can gain a better picture of where things are. Hopefully they’re coming soon.